Next is soil structure. Simply put, structure is how sand, silt and clay fit together. Good structure is evident when the soil holds together if squeezed, but breaks apart or crumbles easily when disturbed. As I work to achieve ideal soil structure, I am constantly working to blend the right amounts sand, silt and clay to get the results I described above. But don’t over-think it. A diverse mix of soil components will pretty much assure you’ll achieve that goal. In my garden beds, (which natively is mostly clay) I usually find adding plenty of compost and aged manure do the trick. The compost is home made. However, the cow manure is another story. 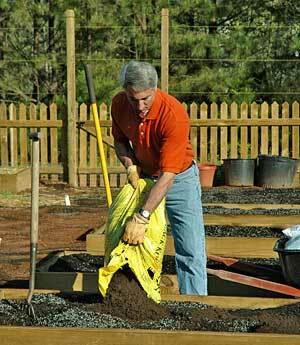 Fortunately, composted manure is available by the bag at many garden centers and home improvement stores. When soil has good tilth, it drains well. It is loose enough to allow for adequate drainage, yet dense enough to retain moisture long enough for plant roots to utilize it. This is why garden soil should neither contain too much sand or too much clay. The key is to know from which extreme you are starting. If soil is too dense, then your action is to loosen it up by adding gritty organic material like composted bark. For soils that are too loose, you want to increase the water holding capacity. Sphagnum peat moss is an option for this. However, in either case, organic material continues to break down over time. Monitor your soil constantly, and amend when needed. Understanding what makes perfect soil will get you well on your way to having the best garden ever. Regardless of your current soil texture, structure or tilth, you can change what you already have. Call it a soil makeover. By adding organic material like compost, humus, composted cow manure, leaf mulch, peat moss, etc. – and a bit of persistence – you can greatly improve any soil. I am planting a vegetable garden in a raised cedar bed. Dug down a foot because we have clay here in Va. put large rocks, sand, manure and soil from a local garden center. Do I need to mix any food for the veggies? I tried last year and plants would flower, but nothing grew . Last time I planted on top of the clay, this time we dug down. Any tips? It sounds like you are off to a good start. If you have time I highly recommend listening to Joe’s podcast with Lee Reich https://joegardener.com/podcast/gardening-science-made-simple/. There are also extensive notes on the Joe Gardener site if you prefer reading to listening. Lots of good information about soil and soil preparation. Have a great season in the garden. How do you feel about Reed Sedge Peat? I’ve been told it’s so good that you can just use it in your raised vegetable garden beds and nothing else with it. I like the idea of a weed free garden of course which I’ve been told the peat would be. I was told by a gardening friend who tried just bag mix for a few years growing his tomatoes but he felt the taste wasn’t as good without some natural dirt mixed in. It sounds like great stuff but just not sure about it. Hi Randy. I’m not familiar with “Reed Sedge Peat”. However, I’m not a fan of using any single-source growing medium that does not contain a diverse amount of organic material from various natural inputs. Diversity is a huge part of what makes up a healthy soil food web and I don’t believe that you get there with a single input source. As for being weed free, even with the peat that you mention, weed seeds will always find their way into your garden. While the peat may indeed be weed-free, I’d rather use a highly diversified blend of organics soil inputs and add mulch on top to reduce the weed population. What could I use to make the soil in my vegetable garden less clay like its super rich soil already and has tons of earthworms in it? I would suggest that you add compost, shredded leaves, shredded mulch, etc so that you introduce more diversity to the soil. And you need to do this consistently over several years to really turn your soil around. That should be OK but the greater diversity of organic material you can add to your beds, the better your plants and soil will be. Keep in mind, your soil will continue to get better as the microorganisms continue to colonize and reproduce there. Add a natural mulch on top of the soil to protect your plants and it will break down over time to improve your soil even more. Good luck. Is it safe to mix Black Kow Manure and Miracle Grow garden soil together to grow grass on bare spots? Yes, that would be fine Gwenette. We live in a farming community in mid Michigan and want to plant a garden of garlic this fall. We will be tilling in some sand and straw, planting music garlic and covering the area with straw after we plant. This garden is a project to teach our 9 year old son about growing and marketing crops. He will be responsible for it’s maintenance and then he will be selling at the farmers market with any profit going into his college fund. Is there anything else we need to do to help get him started on the right path to a bountiful harvest? Love it Robin! It sounds like you’ve got this project covered if you’re just asking about setting up the garlic project properly. It’s a great crop to start with. Just don’t over-water through the fall and winter as bulbs could rot. Good luck to you all and shoot us an update next spring. Foliage should be tall and strong by then. Joe, I have raised beds that I’ve been growing vegetables in for 5 years or so. I want to get some nutrients back in the soil, so I plan I buying Natures Care Organic Raised Bed Soil and Black Kow. My beds are 36″x36″x14″deep. How much Black Kow would you suggest to mix into the beds? I want to make sure I’m not incorporating to much or to little into the current soil Any feedback you could give would be appreciated. Hey Anthony. I think adding about 20% of Black Kow into your existing beds would be good. I love this product and don’t think you can go wrong by adding more. But I like idea of a diverse blend of soil amendments also. That’s why 20% or so blended with the rest should help a lot. Also, another 10% or so of a high quality compost would be outstanding if possible. You can buy by the bag or in bulk and nurseries and landscape supply companies. Hey Joe, I recently got compost for my raised beds, and within a few hours of planting some vegetables (tomatoes, summer squash, cucumbers, zucchini), probably 90% of them died. However, the things I planted in the shade (lettuce, beets, parsley, sage, basil) seem to be doing much better (only one or two seem to be doing not so well, but not nearly as bad as the things mentioned before). Basically, it looks like the plants have totally dried up and shriveled out even though I watered them well. My brother, who has been gardening much longer than I, thinks that it was a bad idea to plant them in 100% compost and that they soaked up too many of the nutrients too quickly and that’s what killed them. He thinks I should go out and get some regular topsoil and mix that in (about 50-50) before trying to replant anything. What do you think? Thanks in advance! Hey Nate. While I agree that you don’t need to and shouldn’t plant in all compost, if it was fully composted, that should not have caused your plants to react that way. I suspect there was too much fresh nitrogen in the compost that would cause your plants to respond that way. But you only need about 15% compost mixed with quality top soil to have a nice blend. You need more than just organic matter (which is what the compost is). You need minerals and a good balance of other inputs. There could be other issues that caused your plants to react that way, such as transplant shock, but it’s hard to say for sure. Don’t know what this is Beth. But after this season or now, I would remix new compost or quality soil into your raised bed so it’s thoroughly mixed. I don’t know what’s causing the pockets though. Perhaps a critter? Mixing all the soil together will eliminate the pockets, at least for now and get you off to a good start before your next planting season. I think it could also be from having raised beds on concrete .if when you water or it rains it could flush out small pockets of water and soil if any leaks .now about your tomato plants I noticed you had mentioned that you had less than a foot of soil, which tomatoes need just as much soil below as you want vegetative growth up top .the more for roots in the soil better the plant. I believe your roots could be compacting as soon as they hit the hard concrete causing poor growth and root production. Hope this helps. Hi Joe, I think the problem with my garden is that the soil is very dense and clay like. My neighbor told me to add gypsum, sand and peat moss. Does this sound right? If so, my garden is 250 sq. ft. How much of everything should I add? Gypsum has mixed reviews as a clay buster Sarah. Years ago it was heavily marketed for this but you don’t hear much about that these days. I’ve never used it and I have heavy clay soil. The best thing I’ve found, and I have a great looking organic lawn, it to aerate it with a core aerator that you can rent. Then top dress with compost. Your goal is to improve the soil health and quality. A 1/2 inch of compost across your lawn surface should suffice. Some of it will find its way into the core holes the machine extracted. That’s exactly what you want to happen. Also, I fertilize with an organic lawn fertilizer (Milorganite). Over a few seasons of working to build your soil health this way should greatly improve it. Also, peat moss added to a dense heavy soil like yours is not recommended. It is best used in the opposite scenario since it holds moisture. Clay soil does not need that. To find out how much soil or compost you need to add over any size area, google “soil calculator”. You will get lots of options to just plug in two simple values and you’ll have your answer. My garden has not been doing good for the last three years, My garden size is approximately 20×30 feet. Between the deer and the soil I no longer get the 250 – 280 quarts of tomatoes I use to get. The deer top all my plants every time they start coming back. At least I think it’s deer because of the tracks, I didn’t even get a tomatoe this year because of this. I’ve put up a fence and had Irish Spring bars every 6 feet and it didn’t keep them away. I spend at least a hundred and fifty to two dollars buying Amish grown plants only to have animals eat the plants before they produce. What can I do to keep all the animals from devouring my garden? Sorry to hear that Sheila. The only sure thing is a fence tall enough (over 8′) to keep them out. While other methods will work periodically, nothing short of a physical barrier (or a hungry attack dog) will do the trick. Deer are that hard to control if they really want at your plants. I can relate first-hand! One other inexpensive option you should try is Milorganite fertilizer. Deer hate the smell and will often not go into an area where Milorganite has been used. It’s not marketed as a deer repellant but university studies show it is very effective as repelling deer. Hi Sheila…..I live in Ct and did have a deer problem a few years ago…..A neighbor of mine solved the problem by attaching monofilament nylon fishing line (50 lb strength)….along the top of his fence about 6 ft high. I followed his lead but ran 2 layers of the fish line about 18 ” apart. This is some really great information for any budding (no pun intended) gardener. I never really thought about how important it is to have good soil before you can start a real garden. I’ve been looking to grow some veggies in my backyard, so this is the exact kind of thing I needed to know. I’ll make sure that I figure out which extreme I’m starting at, and then go from there when adjusting my soil. Thanks so much for writing! I’m looking to ammend two 10×10 plots with Black Kow. How much do you think I’ll need, if they come in 50 lb bags? Hey Andrea. It depends on how deep your beds are and how much new soil amendment you want to work into the existing soil. I would focus on working anything you add to the top 6 inches since that’s where most of the roots will be. Go online and search this term: “how much soil do I need” or “soil calculator”. You will find a number of links to simple online calcualators. All you need to know is how many square feet you have to cover (100 per bed) and how many inches Black Kow or other soil amendment you’ll want to work in. That will tell you how much you will need to buy. I love Black Kow so you can’t go wrong in using a lot of it. So get at least 2″ coverage per bed and work it in. But if your budget allows, get more. You won’t be sorry. There is a cow pasture next to me, Can I use some of that soil to put in my garden? I am not scooping the fresh manure just the area where the grass is not growing and the soil is very dark. Thanks. Yes, if you’re not using it in your food garden and only on the areas where you want to grow grass, then by all means, go for it. There are potential concerns if you were to use this in food crop areas, if the fields have been sprayed with a persistent-herbicide. However, it doesn’t sound like that is an issue for you. I live in north central Florida (Ocala area). I have tried to grow a vegetable garden for many years with very little success. I have a area that gets full sun for about 5 or 6 hours. and I have another area that gets partial or mottled sun for about the same time each day. All vegetable plants or seeds say full sun is necessary. But full sun is too hot. Also, I have purchased Black Cow soil from a local dealer and used it full strength in 4’x8’x 10″ raised beds. And in some cases added lime to prevent blossom end rot in tomatoes. All plants or seeds start out great but within a few weeks just shrivel up or seem to be doing well but don’t set fruit. I’ve spent a lot of money over the years and can’t seem to get anything right. Is partial or mottled sun better than full sun in Florida? Please help! Man Steve. I can feel your frustration. And I would feel the same way. Sometimes a little relief from the heat trumps an extra couple hours in the sun. But as with all things, that depends. You have several issues to deal with here. Accordingly I offer this advice, and for anyone dealing with local growing challenges. Be sure to take advantage of your local county extension service. They are typically staffed with volunteer Master Gardeners during the week manning the phones to take your questions. They are pretty passionate folks, happy to help and have time to research you questions for you. And because they are local, and backed by a team of University professionals and other Master Gardeners, if they don’t know the answer, they can find it and get back to you. So Steve, in your case, seek some local expertise as I mentioned here. Also, find a really good local nursery or independent garden center (not a box store). They are staffed with passionate, knowledgeable gardeners that will be happy to help you. Hey Joe nice article . But i would have to correct you on one part. Black kow manure is available in the northeast Living in Connecticut i have used it for the last 3 years from my local Home depot Nice soil tips ill be sure to tweek a few things in my gardens now thanks. Good to know Niles. Thank you for updating this information. This is good news! It has been a while since I wrote that. I live in Australia and I have just pulled up all our garlic. Can I plant lettuce, spinach etc right away or should I leave the soil to rest for awhile. If I need to let it rest, for how long and what could I add to help it along? Hi Donna. Feel free to plant right away. I don’t see any reason you need to let your bed rest after harvesting your garlic. lettuce and spinach are shallow rooted plants and depend mostly on nitrogen near the soil level for their nourishment. As a bulb, garlic is a heavier phosphorus user with roots mostly below where lettuce and spinach venture. Good luck and happy harvesting. Thanks for writing. Thanks for all the great information! My question is this: how soon after using compost in the garden do I need to plant? I just moved into a new home in Va and plan on using a Tumbling Composter this Fall to kick out plenty of the good stuff for flower and vegetable gardens for next Spring. I wanted to lay out the garden (square foot garden, above ground, but not raised on a stand), and flower terraces (brick, also above ground), and add in the compost mixture as it gets ready, to make room in the composter for the next batch. If I add to compost into the garden soil in November, will it still be beneficial for the planting in the Spring, or does the benefit expire or diminish in some way? Hi John. That is a very smart question you ask. In my opinion, (and I also ran this by Dr. Jeff Gillman), you should add your compost to your soil when it’s ready and get it working there. Put it to work so to speak, building overall soil health where your plants will go eventually vs. having it just sitting around vs. sitting around and un-utilized. My vegetable garden plot is on the sunny and hot side of the house, up against a white wall (it’s my only option). I live in the low Sierra Nevada Mountains with lots of pine and manzanita in other parts of the yard. I was wondering if I could use pine needles as a protective layer around each plant to hold in moisture? I don’t plan to dig it into the soil, just to use as a barrier to hold moisture in and around each plant, I would then rake it out at the end of the growing season. We are on water restrictions and so water is at a premium. I was thinking the pine needles would hold moisture in, keep pests out, and keep the weeds down. I’m just worried about the acidic nature of pine needles. Your thoughts? Go for it Jennifer. Any mulch is better than no mulch (almost), and I wouldn’t worry about the acidity of the pine needles. By the time they break down, they won’t be as acidic and the process is so slow anyway, especially if you’re just laying them on top. Joe, I’m going to build a raised bed and make my own soil. What ratio of ingredients should I use? Black Kow, compost, other ingredients, etc. I’m in the Houston area. Hi Libby. Here’s a link to an article I wrote to help. But essentially as long as you’re adding a mix of organic matter, like compost, Black Kow, shredded leaves, topsoil, worm castings, and native soil so that you have a blend that binds together when squeezed but still breaks apart when disturbed, you’re set. Then do a soil test to find out what nutrients you may still be missing. I find that by focusing on blending ingredients that are organically based is a no-lose combination. I may have messed up. In the fall, I began adding all of the gathered up dog poop to the garden. When the leaves came, I put them in the garden. All winter, dog poop. This spring, I tilled it all up, and then planted tomatoes, cherry tomatoes, cucumbers, spinach, lettuce, bush green beans, and zucchini. Now, I’m reading that dog poop is dangerous and leaves are bad, but everything is already growing. Is this food going to be safe to eat? Do I need to rip it out for this year and treat the ground? Yikes. While leaves are fine once they decompose, dog poop is not safe in the food garden. I would contact a soil testing company that can test for disease pathogens. You can do an online search for “soil testing” or start with contacting your county extension service. While they do offer soil testing, the standard test does not look for disease pathogens. But see if you can pay for a specific test. Otherwise, you’ll have to use a private lab. If this is not an option, personally I don’t think I’d trust the safety of the food growing from that soil this year. While I am certainly not a scientist, I would welcome others with authority to chime in here. I know that for some people, they do include pet waste in their compost. But for a food garden, I would simply not be comfortable with this option. Last year we started composting an area of our yard for a veggie garden. Unfortunately my husband did not know about the toxicity of dog manure and added it as well, for several weeks before we learned that was a no-no. So, is that area forever unfit for edibles? If not, how long do we wait or is there something we can do to treat it? Give it 6 months and proceed in my opinion. While there may be pathogens that are harmful now, over time, other bacteria and fungi will work to deactivate the harmful effects. Continue to improve that area with more good compost so you are introducing the “good guys” of compost. I am trying to prepare my lawn for an organic vegetable garden in the spring. I didn’t want to till so I put down cardboard with straw and some topsoil to kill the grass. Is this a waste of time? What do you recommend? Should I just wait till early next year to prepare the lawn? Definitely not a waste of time to start now preparing your space for next spring’s organic garden. You need time to smother and kill the area and it can take months. What you are doing now is a great way to soften the area, improve the soil biology and preserve the soil integrity by not tilling. Good for you Renea. I live in East Texas and have sandy soil for my vegtable garden. How much area will a 40 pound bag of cow/humus/compost cover? My garden is about 3,200 sq. ft. Will 150 bags be sufficient? James, do a web search for “soil calculator” Pick one of the options. It will likely bring up an easy to fill in blanks based on the square footage of your garden and the depth of soil you would like. It should tell you in cubic yards and feet, how much soil you need to add. I planted some Hibiscus flowers about 3 gallon size here in South Florida. We added Black Kow to the holes and watered them and backfilled . Just wondering if I should of added peat moss also . ? Peat moss will help retain moisture and if you are going to add it, should be incorporated into the entire soil mix before planting. In native soils that drain too quickly, peat moss can help. However, Hibiscus does well in south Florida in native soil without peat so I would not go back and change anything now. You should be fine as long as you water sufficiently until the roots are established. Then the plants should do fine from there as is. I love Black Kow and yes, you can add it any time. It’s a great soil amendment in my opinion and safe to add before, during and after plants are in the ground. Tom, Black Kow is a favorite product of mine. But I always like to create a blend of several inputs to create a more diverse soil. Consider adding compost (purchased in bag or bulk), shredded leaves, bagged mulch, mushroom compost, etc. Be careful about using manure from horse farms. A huge problem these days is a persistent herbicide that is sprayed on hay that horses then eat. The herbicide does NOT break down quickly and can kill your plants in your vegetable garden when used as compost. If you want to learn more about this, search “killer compost” on our site for a lot more details on my own experience with this in my garden. Good luck. can i use straight black cow for starting seeds? Hi Kt. I think so. I’ve never tried it but I think you should be fine. You just need a clean soil environment that drains well for your seeds. Black Kow is a great product. It drains well, which is important for seed starting. The biggest concern that I can see is the potential for burning the tender young plants based on the nutrient content in the soil. But as an organic, composted product, the nutrient analysis is very low (0.5-0.5-0.5) so I don’t see any risk of burning. Please do us all a favor and give it a try. Then report back. I know we would all appreciate learning through your experience. What is the best way to spread black kow over my cencentipede lawn? Tried using a Scott spreader which seemed like a great idea, but to no avail. Help! Great product choice Shelly. I wish I knew of an easy way to spread it. Since it comes in bags, I would slit the bag at the top and walk it around your lawn as it spilled out as evenly as possible. Then take a steel tined rake or a grading rake and turn it upside down. Use the flat back side to knock down and smooth out the clumps. The back side of these rakes is an underutilized method by home gardeners to easily smooth out and distribute soil, just as you are describing. Good luck and great question. I live in Michigan, and my husband and I are first time gardeners. The area we cleared out for our garden was once part of our gravel driveway, and therefore, we have no dirt to start with. What would you recommend starting with to form a base for our soil? Everything I find assumes that there is dirt available to add to, which is not the case for us. How soon after doing this can you plant an edible garden? A week? I have been told one week. I read several months. Do you know? Can you tell me? Once the soil is prepped, plant away Susan. No reason to wait if it’s based on what I suggested in my post. The only reason I can see waiting is if you were to put down and herbicide to kill off any weeds. In that case, yes, waiting a week is smart. But as an organic gardener, that’s not an issue with me. Once I amend the soil, it’s time to plant. I like the way you start — preparation of the earth. Perhaps instead of depleting sphagnum peat moss supply, you could suggest more soil builders that are right under our noses or near by like leaves (lots of folks put them out for trash pick up), pine needles, seaweed, manure from a riding school, wood shavings, chipped wood from tree service companies and don’t forget that some counties make mulch and let folds pick it up for free. A friend of mine completely replaces his soil every few years in his raised beds. It has legs so it is never in contact with the ground. I think that it is unnecessary as long as you add amendments to it every year. What do you think? If you agree, what would be the best amendments for this type of garden?